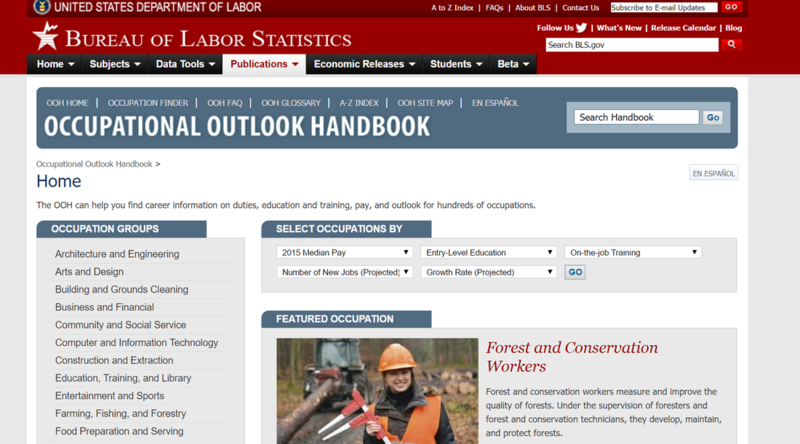 ​The Bureau of Labor Statistics website has a plethora of information. I am excited to find this website and all that it has to offer. 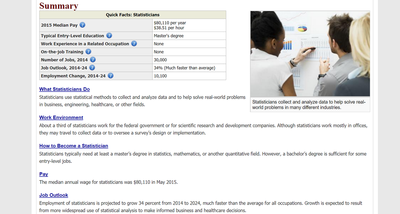 On the home page, you can search occupations by wage, entry-level education, on-the-job training, projected number of new jobs, or the projected growth rate. The website also allows you to refine your search by searching through more than one of the listed searches at one time. ​I searched the projected growth rate of jobs and found many are health related occupations, but was surprised to see that wind turbine operator is one occupation that is expected to see the most growth. Other occupations projected to see growth are financial advisers, statisticians, and research analysts. You can then select one of these occupations to find out even more. 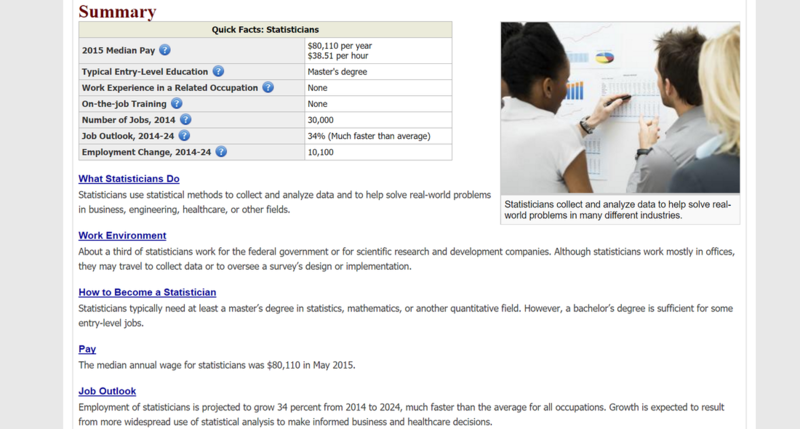 I selected statistician and was able to learn what statisticians do, about the work environment, how to become a statistician, pay and job outlook, state and area data, as well as similar occupations. The website even explains why this job is expected to see growth, and the reason being the widespread use of statistical analysis to make informed business and health related decisions. I also explored the declining professions that are listed on this website. This is vital information for students to be aware of. Students may want to study an occupation and not know that it is in decline and will not be an option for them once they have finished their studies. I do notice that when you look at these professions, it merely states that they are declining, and the site does not specify at what rate they are declining, unless you select the actual occupation. For example, computer programmers are listed as declining by -8% while advertising sales agents are declining by -6%. This is very interesting to me as a teacher as well. Teachers need to stay informed on this as we guide and aide students in making informed decisions about their futures. I went ahead and checked on the teaching profession while I was on the website. I found out that the future outlook will depend on the region and the need for elementary school teachers is expected to grow at about 6%. I appreciate that the language and text complexity seems appropriate for upper grades students. It is not written at a level that is too difficult for students to comprehend. The gifted teacher at my school has her students choose an occupation and research their projected wage, job description and then look into which house or car they would be able to afford. This website would be a great reference for students to use while completing this assignment. This is an incredibly useful resource for students trying to decide about their futures and even for adults to make informed decisions about their current occupations. ​Grades: 4th and up. Subject(s): Occupations. Overall rating: 9.